Set up Conduit AEP and mDot for use with LoRa. Refer to AEP: Getting Started with LoRa. Log into the AEP interface. Refer to Getting Started with AEP if needed. Log into Node-RED with the password set in the wizard. The default password is admin. Click on the Debug tab at the right side of the page to view received lora packets. UTF-8. 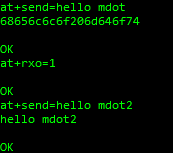 The payload of the LoRa packet is parsed as UTF-8 characters before being injected to the flow. Bytes. The payload of the LoRa packet is not parsed before being injected into the flow.